All phases of the fabrication process required the use of forklifts and cranes. The 8' x 20' type 316 stainless steel plates, half inch thick & weighing more than 3300 lbs. 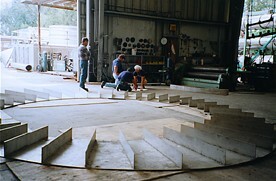 each, were lifted and positioned onto the bed of the computerized abrasive water jet cutter. After two weeks of precisely cutting the component parts of the sculpture, fitting and welding began with the outside half inch skin and internal ribs. The two inner disks under fabrication. Throughout the eighteen month long project, Hal Stowers worked closely, hands on with the fabricators, making necessary aesthetic decisions at every step along the way. "A project of this scale and difficulty, with a need for precision and attention to detail, can only be done through a strong team effort. A high degree of skill, perseverance, blood, sweat and tears, faith and determination by the SUN TIME Team made the difference. Everyone went the extra mile. Every facet was Large about this project." Harry, Rojo & Juan welding the difficult to reach, more intricate details of the smaller disk. All welded joints were meticulously ground flush. More than 2000 man hours of grinding and polishing was required to accomplish Hal's "Desired Effect." 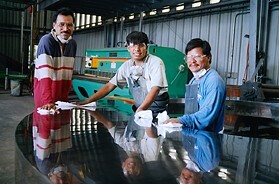 Reflective qualities begin to emerge as Juan, Pablo and Pascual massage the final polishing. Charles Cook rides high and maneuvers the second disk into place. Hal precisely cuts away protective wrap to expose the area to be sandblasted. The coarse texture of the sandblasting defined the lower edge of the polished ellipse at the base of the sculpture. It's been a long day and a late night for Hal, Dave, and the rest of TEAM SUN TIME. Early the next morning the Sculpture was transported to the site for installation. 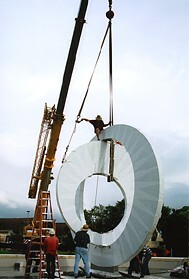 The three large components of the sculpture were transported as an "Extra Wide Load" with sheriff escorts from Dunedin to Clearwater. A 150 ton crane was waiting at the site. 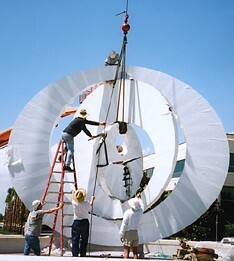 The large outer ellipse was lifted and " lit like a bird" onto the Sculpture's foundation. It was carefully leveled, bolted down and welded in place. The second disk was more of a challenge with its asymmetrical weight and the tight tolerance between disks. It was finally positioned onto the bottom pin and then rolled and cranked until the "drift pin" at the top dropped, securing it in place. R.W. Cook, John Cook, Hal and others work to set the third disk on its pin and roll it into place. Special thanks to ALL the individuals who contributed to the creation of SUN TIME. Certain people involved from the beginning, and who went the many many extra miles required at the end, are listed here. The two inner disks were rotated on their axis until Hal gave the signal that they were in the exact juxtaposed position he desired. Lead welder Harry, then performed the final welds. GO to: SUN TIME UNVEILED!! !